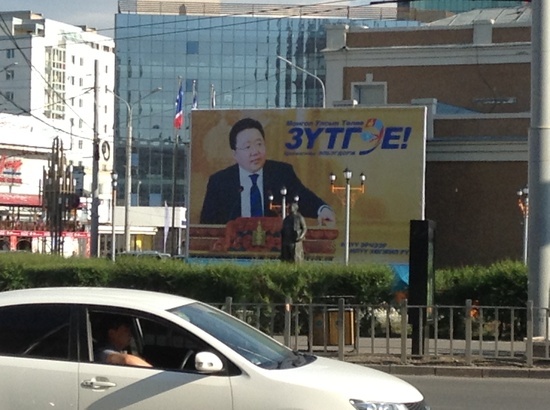 I am amazed how quiet Ulaanbaatar is in terms of the election. 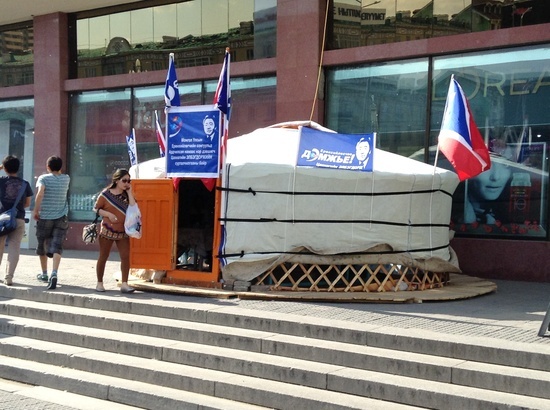 In walking through central Ulaanbaatar yesterday, I have only come across a single campaign post around Sukhbaatar Square (which now has an insta-museum for the T.Baatar dinosaur skeleton), namely for Elbegdorj, fastened to the old building kittycorner from the SW corner of Sukhbaatar Sq that is owned by the DP. Yes, that is the lone visual evidence of the election campaign in the centre. Even the oh-so-grand MPP building does not have any campaign visual attached to the building in any way. In front of the State Department Store I came across a lone DP propaganda ger that was staffed and offered campaign materials, but received no visiting passers-by in the brief period I observed. My casual observation is echoed by the OSCE report (PDF), “The campaign has thus far been active but low-key. The visibility of candidates’ campaigns varies significantly in different parts of the country “. I have not seen a single group of door-to-door canvassers. How are students earning extra money this June? Any Views of the Campaign? No one I’ve spoken to so far (I’ve only been in town for 40 hrs.) has voiced any excitement about the election. The assumption that Elbegdorj will win is a near-consensus, and few people seem to be expecting a run-off. Everyone has agreed that it’s been a fairly quiet campaign, though there were some campaign events in the city last weekend apparently. Everyone has mentioned the recent round-about fraud allegations against Elbegdorj, but there also seems to be a near-consensus that these allegations are most likely a smear campaign, or what’s known here as “black campaign”. These allegations thus do not seem to be taken very seriously. I haven’t heard any particular discussion of the qualities of Bat-Erdene or Udval as alternatives to Elbegdorj and Udval seems to be generally and fairly easily dismissed by most people I’ve spoken to. It’s surprising to see this kind of consensus given the uncertainties of all election campaigns. Presumably, everyone I have spoken to what invest heavily in Elbegdorj were there a campaign market of the kind that colleagues at UBC ran for the recent British Columbia provincial election, for example. I’ve given some thoughts to the idea to set some sort of voting market up in Mongolia, in part to balance the near-absence of polling and the absence of domestic exit polling. Note, however, that the election market got the BC election just as wrong as all the polls did. However, the kind of consensus that I’m hearing here makes me a bit suspicious as to the impact it might have on voters. If this consensus is not limited to the tiny set of people that I’ve been speaking to, will we see voter participation drop? Can Elbegdorj supporters be motivated to make their way to polling stations on Wednesday? Will Bat-Erdene voters give up on their candidate? Will Udval supporters make a strategic choice and support Bat-Erdene to give him a chance or stick with Udval to possibly force a run-off? This latter question will be on to pay some attention to in media coverage, but also in any campaign events that I’ll manage to observe before Monday night. The OSCE Interim Report describes a “charged atmosphere” due to concerns about the electronic counting machines. I have learned that it is part of the OSCE monitoring methodology that they do not compare an election to previous elections or elections in other jurisdictions, but on the matter of the choice of words of a “charged atmosphere”, I would have to disagree in part on the basis of having observed three previous national elections here. The most tense election I have monitored was clearly 2009, largely out of concerns about some kind of repeat of the riots of 2008. Despite this general worry, that election introduced few innovations in terms of the election law or the mechanics of voting, so that concerns of that nature were not very prevalent. The greatest disputes in terms of the organization of the election arose around voter registration that year. By contrast, my sense is that the atmosphere was closer to “charged” last year in the run-up to the parliamentary election where a new voting system combined with the introduction of electronic counting and biometric identification cards all meant that the mechanics of voting changed quite a bit, leading to some confusion on the part of voters and officials about aspects of the vote. While electronic counting had been explicitly introduced as a confidence-building element to counter frequent and usually un-proven allegations of electoral fraud, it is not clear that this had the desired effect in 2012, at least not immediately following the election. However, the few manual recounts that were conducted produced results that were very close to the electronic counting and thus silenced some of the allegations of fraud without really seeming to produce an overall higher level of trust. In the run-up to the current election, Bat-Erdene has been most vociferous in casting doubts on electronic counting and encouraging a greater number of manual recounts. I personally cannot really see what’s wrong with such recounts other than some administrative and logistical effort. Some kind of random selection of a reasonable number of polling stations to recount manually in days after the election could potentially build greater confidence in the results, assuming that the electronic counting was bourn out by the manual recount. Last night, I saw an ad that showed rapping youngsters pull out a voter information card telling them to vote on Wednesday. Clearly, this was a public service message to encourage voting aired under the auspices of the General Election Commission. In this ad, I noticed that polling stations will be open 7-22h on June 26. If memory serves, they closed at 19h in previous elections and I imagine that this is an attempt to make voting easier and encourage more of it by offering longer hours. While it was common in 2008 (when many observers, including myself were not allowed to observe the counting of votes) and in 2009 for long lines to form in the last 30 minutes of voting and for voters to come rushing up to the doors just before they were closed, I saw less of this in 2012, though I also staid put in a single urban polling station last year to observe the end of voting and the count, so I have less of a sense of other stations and lines that may have formed. In any case, extended hours surely will encourage at least some additional votes which has to be a good thing. Next, there was a campaign ad for Elebgdorj that prominently features coalition partners like the CWGP’s Oyun, and sports stars like Asashoryu and judo grappler Tuvshinbayar endorsing Elbegdorj. Individual statements included in the ad were too brief to be substantial beyond endorsement. This entry was posted in Civil Will Green Party, Democracy, Democratic Party, Elections, Mongolian People's Party, Mongolian People's Revolutionary Party, Party Politics, Politics, Presidential 2013, Public Opinion and tagged Julian Dierkes. Bookmark the permalink.